Regina Parra, Chance, 2015-2017, neon light, 215 x 250 cm. 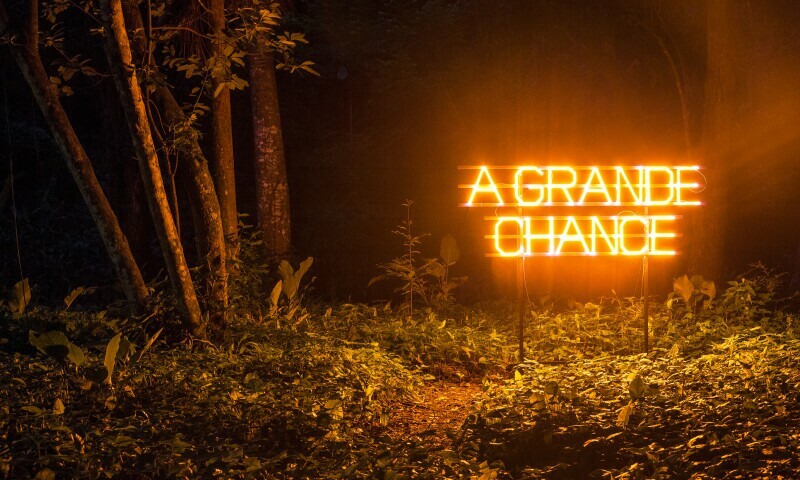 Chance (2015-2017), by the São Paulo-born artist Regina Parra, also acquired through the Patronos da Arte Contemporânea program, was previously displayed in Parque Lage, set up amidst the park’s Atlantic rainforest, in Rio de Janeiro, and also in Parque Ibirapuera in São Paulo, and is now being exhibited in room C. The work sports the phrase “The Great Chance” in red neon, and presents itself as an ambiguous portal that can be interpreted both as a promise and as a threat. Born in São Paulo in 1981, Parra holds an MA in Art Theory and Criticism from Faculdade Santa Marcelina and a BA in Fine Arts from FAAP. The artist has participated in numerous exhibitions, including Sights and Sounds, at The Jewish Museum, New York; cães sem plumas [featherless dogs], at the Museu de Arte Moderna in Recife and in the 17th edition of the Festival Internacional Sesc Videobrasil [Sesc Videobrasil International Festival].